Lying is part of human behavior, and most, if not all people, use it in various situations throughout their life. From kids who want to avoid being scolded by their parents over a bad grade to adults who have a lot more serious stuff to cover, everyone lies. Spotting a liar can be difficult, especially if the person in front of you is an expert at that. Here are some tips that will help you identify liars with ease. When someone lies, his or her brain will work overtime, and that means that it is difficult for the mind to control everything, especially changes in expression. Someone who’s lying will often blush, which is a sign of anxiety. Other similar symptoms that would expose a liar are flaring nostrils, fast blinking, and distressed breathing. A liar will try to cover his or her lies by acting as if the entire body could be exposed. Let’s not forget that humans are part of the animal reign which means that some of the things they do are still very similar to what other creatures do. For instance, when in danger, it is typical behavior to try making yourself as small as you can. That can translate in a hunched head between the shoulders, pulling out arms and feet, and also standing unmoved for extended periods of time. It is also common for liars to hide their hands behind their backs, to avoid exposing nervous reactions, such as fidgety fingers. Smiling is human behavior that can help you a great deal when you try to identify someone lying to you. Did you know that it is also one of the most challenging expressions to hold for a long time without appearing fake and insincere? Models who work in commercials have a hard time mastering the secret of sustaining a smile for a long time. When you want to spot a liar, you need to watch how the other smiles. A genuine smile will not only make the corner of the person’s lips curl upward, but it will also engage the eyes. If this is not happening, then you know the other is insincere. A liar will have a hard time controlling the way he or she speaks. Notice the changes in the speech pattern used. 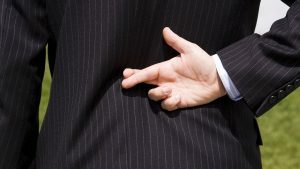 If you notice signs like rapid breathing or slowing down, that could be solid proof that you are dealing with a liar. What words are used? What words are avoided? Liars have problems with the vocabulary they use when telling their lies. For instance, as they try to hide the things that they don’t want to say or for which they wish to present a different version, they will not use personal pronouns, like I, or mine. Also, they will stay away from complex phrases as it can be difficult for them to keep track of the lies they are constructing. If the person you suspect to be a liar is someone close to you, one way of being able to tell whether they tell the truth or not is to notice changes in behavior. When people lie, they tend to pay more attention to how they act, and that lends their behavior an artificial characteristic that you will be able to tell if you are close to them. Liars lie because they have something to hide. You don’t need a typewriter to put down a long list of things such people might want to hide and try to identify where and how they lie for each situation in particular. What you need is to pay attention to the way they behave in general when you’re asking them questions. One way of spotting a liar during a conversation is by asking a simple question. 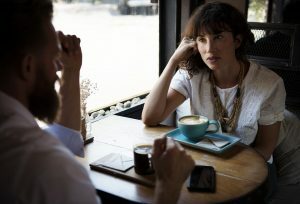 If the person you’re talking to averts his or her eyes, and there are other signs that he or she is uncomfortable, then you will know that you are dealing with a liar. Sometimes the lies may be about little things, but sometimes they can affect essential parts of life, which is why you need to spot them.